Amazing WWII Nose Art, Flying Tigers Shirt remembers dramatic WWII warplane history. Our Flying Tigers Shirt is a replica detail of the insignia that graced the warplanes of the famous "Flying Tigers" of WWII. The Flying Tigers was the name given to the 1st American Volunteer Group that was commissioned to help protect China against Japanese attacks. WWII nose art like this is rare to find as many photos and memorabilia of that era are long gone but we found several historical references in order to painstakingly recreate this important nose art shirt. 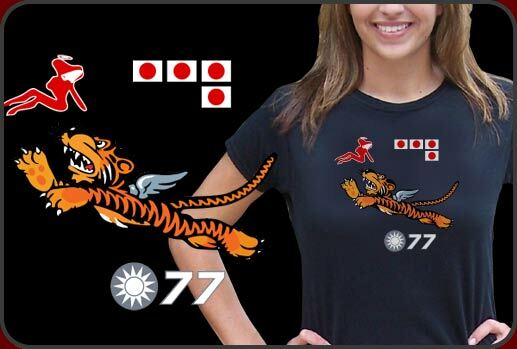 Our Flying Tigers shirt is a beautiful and historically meaningful t-shirt to own.